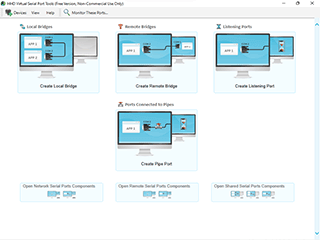 Free Virtual Serial Ports is a Windows user-mode application, which allows you to create software virtual serial ports and emulate physical serial ports behavior. It operates exclusively in user-mode, therefore it is more stable and uses less memory, processor and operating system resources than any competitive products. It behaves exactly like hardware serial port with full serial port functionality, providing baud-rate emulation, configuration of data bits, parity (odd, even, mark, space) and stop bits, XON/XOFF software and hardware flow control, etc. Our free virtual com port drivers allow you to emulate custom Plug-and-Play (PnP) serial ports and I/O ports interfaced by 16550 UART: COM1, COM2, COM3, COM4… COM255 correctly registered and visible in Windows device manager under standard Ports (COM & LPT) device class. Our free com port null-modem emulator allows you to create virtual null-modem cable in order to emulate hardware null-modem cable with DB-25 or DE-9 connectors and Serial (Modem) control lines: Transmitted Data TxD, Received Data RxD, Data Terminal Ready DTR, Carrier Detect DCD, Data Set Ready DSR, Ring Indicator RI, Request To Send RTS, Clear To Send CTS. Virtual serial lines behaves exactly as real hardware serial lines. Freeware virtual serial ports may be applicable as some kind of serial port redirector/COM port redirector which uses network interface to create and pair virtual serial communication ports on the same PC. It allows two legacy serial applications to communicate using created ports instead of using named pipes or any other modern inter-process communication mechanisms. Unlimited number of virtual COM port pairs may be created and used by COM port based applications to establish interconnection. Virtual comm ports may be even more suitable for several serial applications than a HW serial ports. Virtual serial ports connection is much faster than physical null-modem cable connection and it depends only on your CPU, RAM and overall system performance. Free Virtual Serial Ports supports Windows desktop and server platforms starting from Windows Vista (x86 and x64), including Windows 8/8.1 32-bit and 64-bit operating systems. Supports all standard bit rates of 75, 110, 300, 1200, 2400, 4800, 9600, 19200, 38400, 57600 and 115200 bit/s. Uses only user-mode OS API calls, making program and system much more stable. Supports Windows WMI, Power Management, PnP and more technologies. Dial-up modems, terminals, printers, RS-232, RS-422 and RS-485 test instruments, industrial equipment and automation systems, PLCs, VFDs, servo drives, CNC RS-232 controllers, laboratory automation equipment, scientific instruments, Serial device servers, NPort servers, multiport serial boards, Serial to fiber converters, RS-232 to RS-422/485 converters. Shop fitting and retail equipment: EPOS and POS terminals, bar code scanners, card readers, weighing systems, door entry and HVAC systems, bar code readers. This is useful tool for testing, development, debugging and analysis of serial hardware and software applications. FVSP utility allows you to establish unlimited number of virtual serial connections and use it to exchange traffic and data streams between different serial applications. You may also emulate packet loss and connection breaks in order to test and analyze serial device failures. Download this Free Virtual Serial Ports kit and start to emulate Serial Port communications in just few seconds! Reliable It uses only user mode API calls. Flexible It supports different serial port bridging types. Compatible It works with most serial port applications. Handy It's compatible with most serial port sniffers.